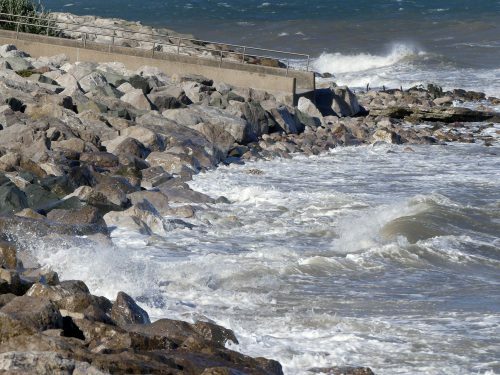 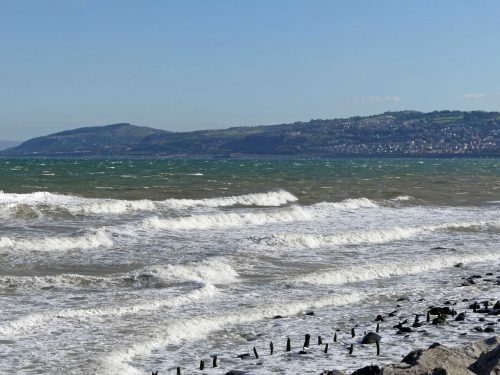 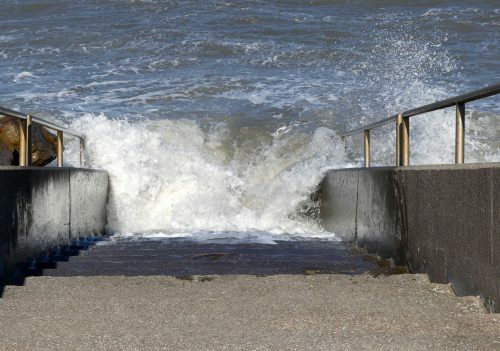 Colwyn Bay, on the Irish Sea, has big tides and at some high tides water levels can rise by 8 metres or more. 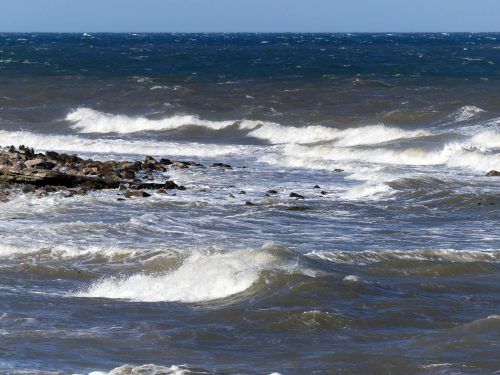 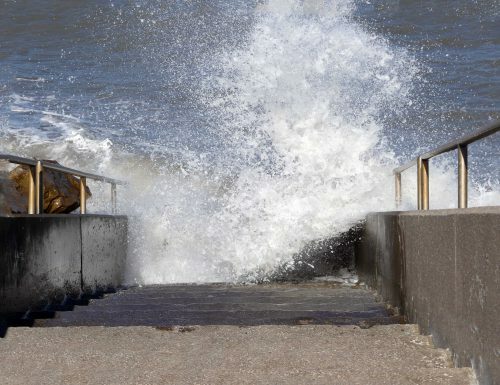 On windy days big waves are driven in and as the tide reaches its highest point they crash dramatically, in places causing spray to rise and splash over the sea defences. 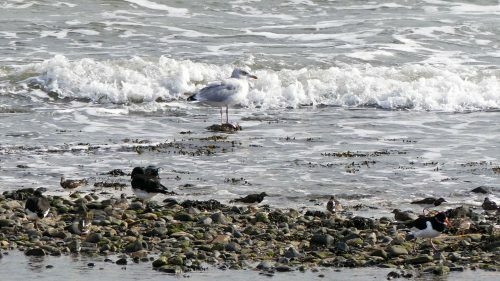 Regardless of the weather, for the gulls and wading birds that feed here it is business as usual. 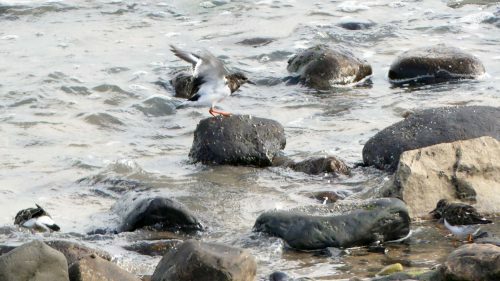 For people, walking along the promenade on such days can be hard work and exhilarating, but for the birds that feed here on Rhos Point it has to be business as usual and whatever the weather or state of the tide the birds know instinctively exactly when to arrive and depart to best take advantage of fresh deliveries or deposits of food. 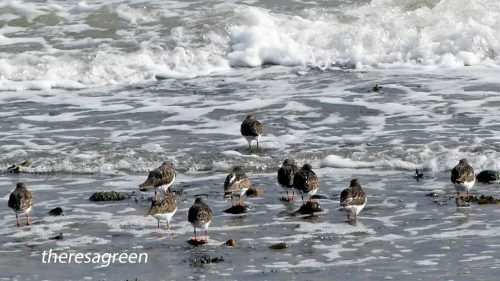 Interested to see how the birds responded to challenging conditions, I took these photographs on an exceptionally windy day when the incoming tide was set to be particularly high. 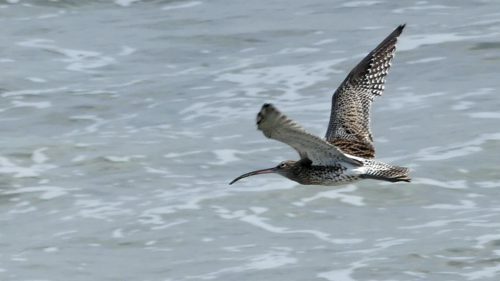 12:51 – Curlews begin to leave. 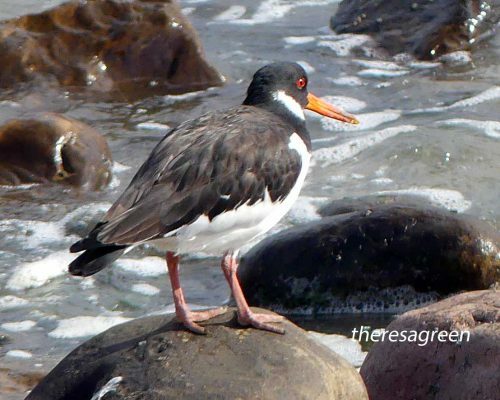 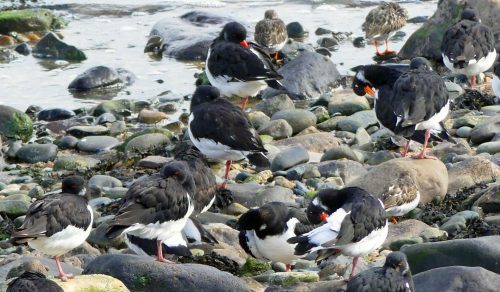 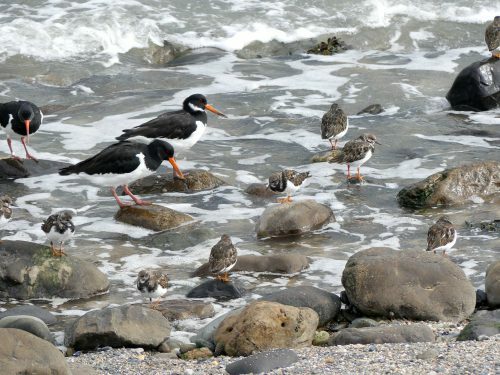 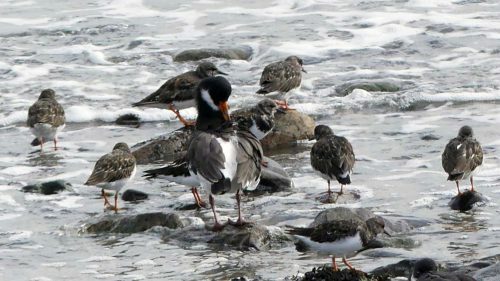 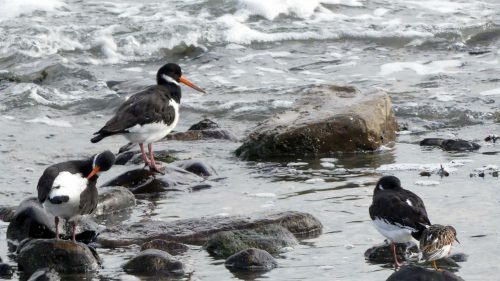 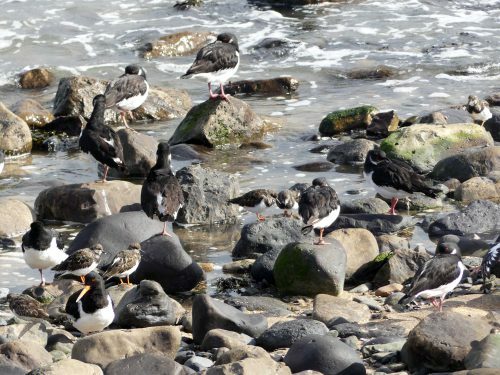 12:52 – Most of the oystercatchers that feed here don’t travel far, passing the time between the tide-turns gathered together on the rocks of the seabreak in Rhos Harbour, a short flight away. 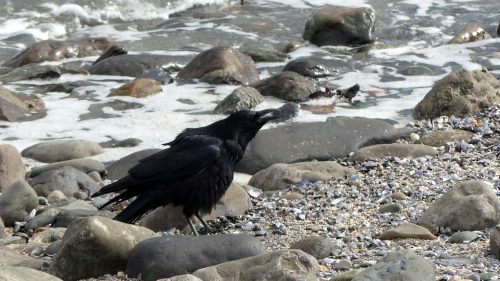 Some linger longer than others. 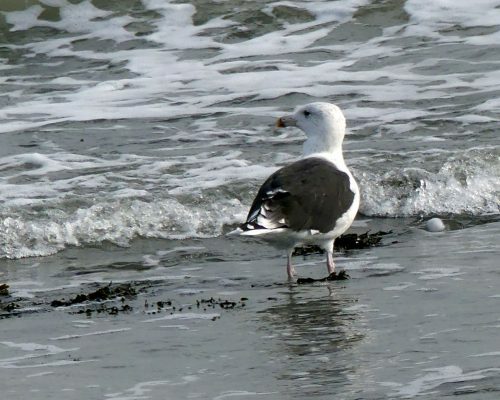 12:54- Big and bulky, Greater Black-backed gulls seem impervious to the rough conditions. 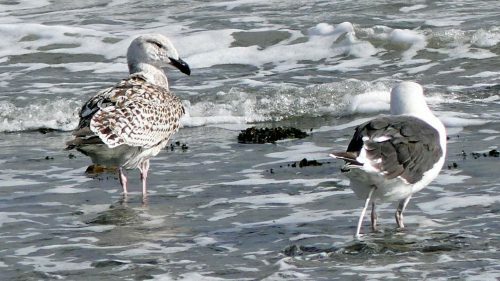 12:57 – This photograph of an adult and juvenile Great Black-backed gulls cries out for a caption doesn’t it? 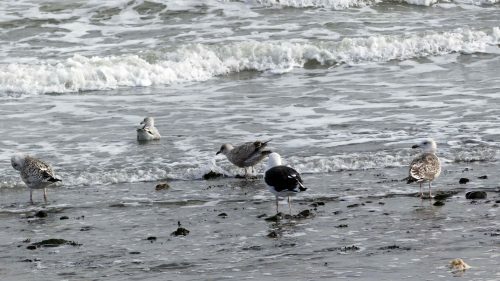 I’m leaving it to your own imaginations though. 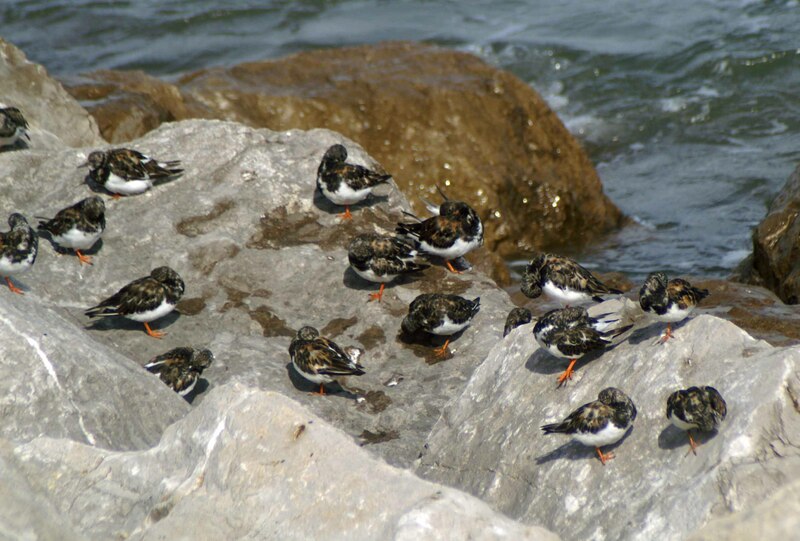 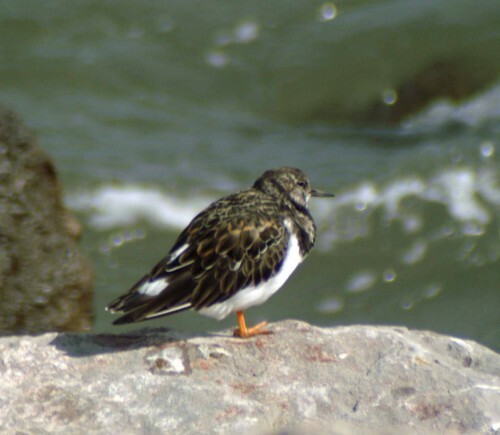 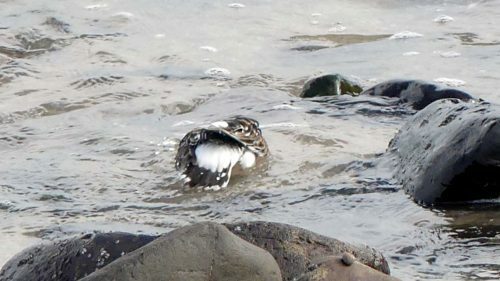 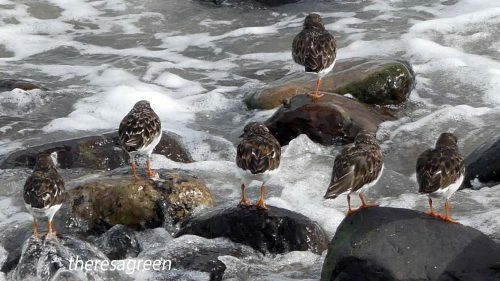 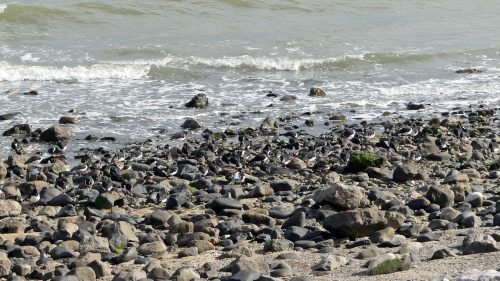 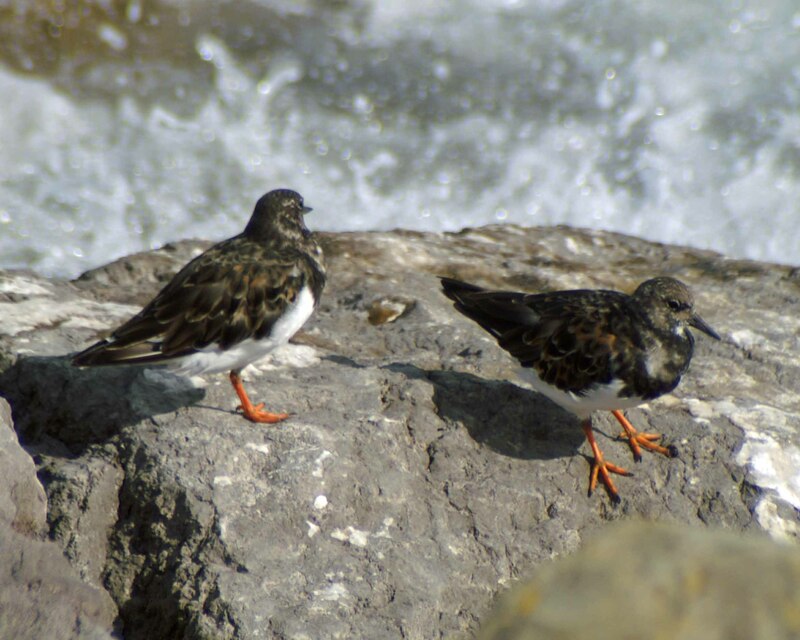 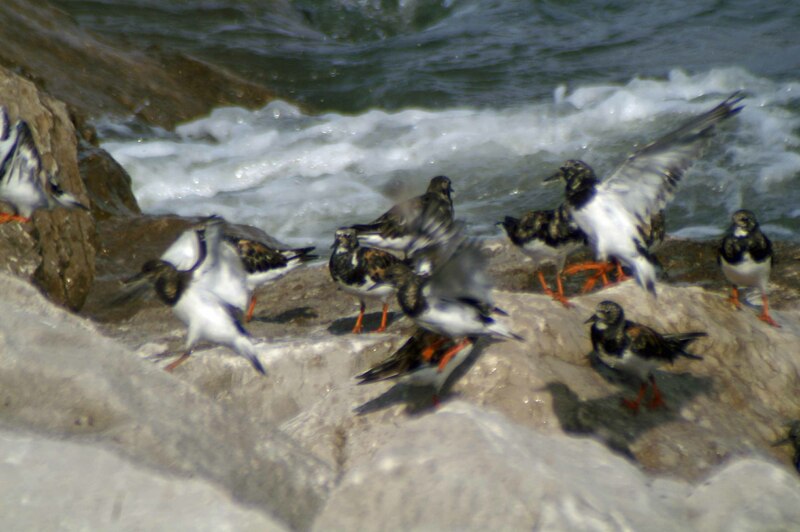 12:58 – Turnstones on the sea edge, most standing on stones to keep their feet out of the water. 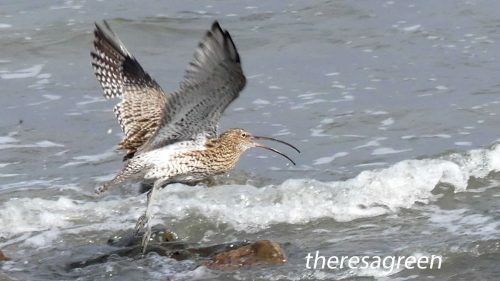 12:59- Another Curlew leaves, calling to announce its departure. 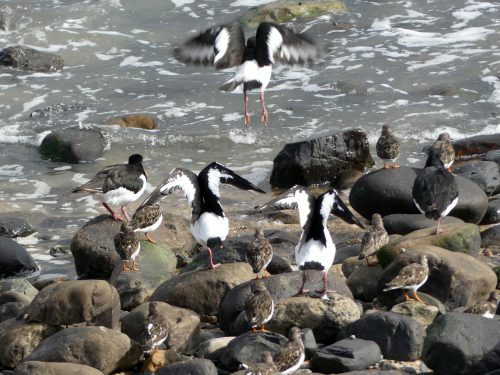 12:59- Turnstones and Oystercatchers. 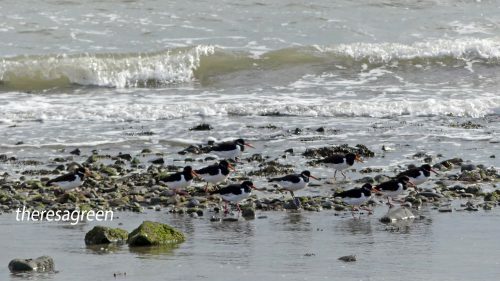 Interesting that they are all facing towards the incoming water but weren’t actively foraging for food. 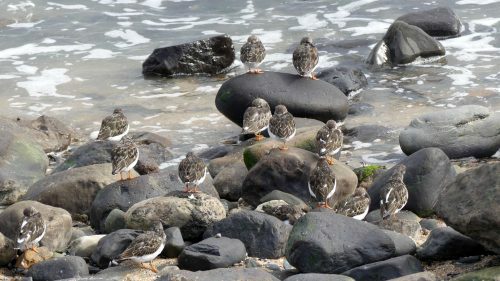 I think they are all facing into the wind, which would make them more aerodynamic and streamlined so they don’t get blown over. 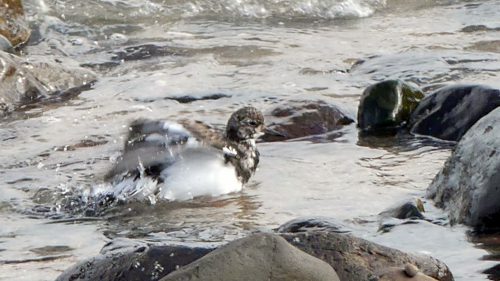 13:03- Smoothing feathers ruffled by the wind back into place. 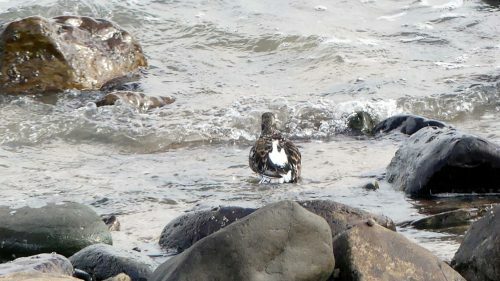 13:05 – A Turnstone takes a bath, or is that a jacuzzi? 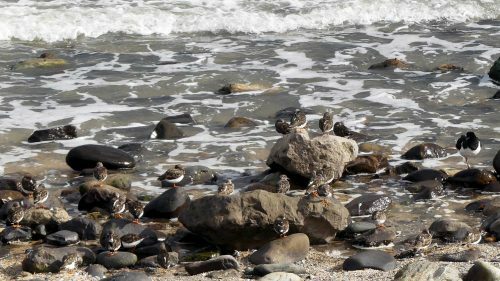 13:07- The Turnstones are more-or-less gathered together now. 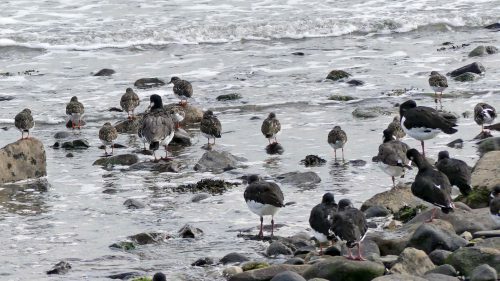 They are difficult to count as they merge so well into the background of small rocks, but I got up to about 56 individuals and I’m sure there were others behind rocks and one another, so the actual number is probably 60 plus. 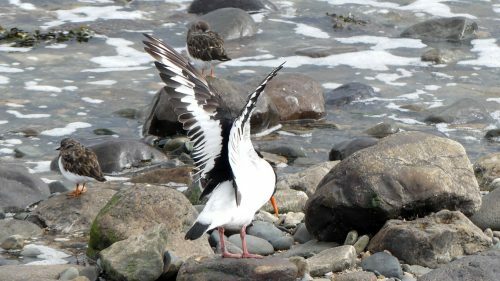 13:23- Another Oystercatcher is ready for the off. 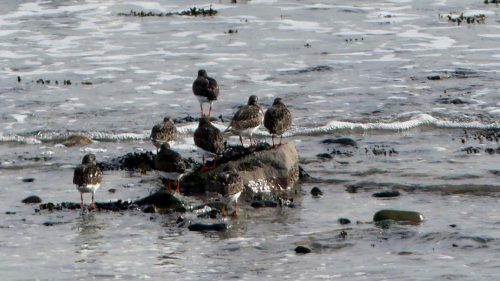 and are the last birds standing. 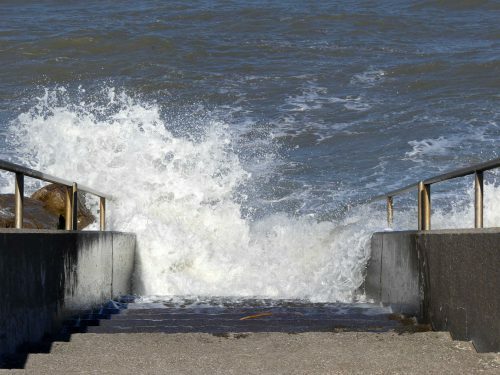 13:45- The water has covered the Point. 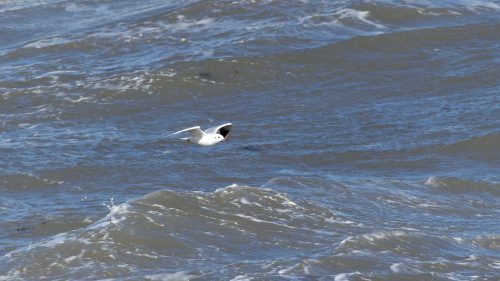 Black-headed gulls are the only birds still flying. 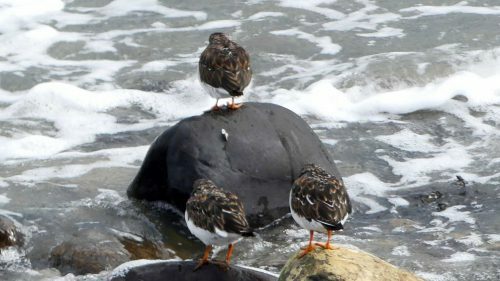 Low to the surface they seem to positively enjoy the rough conditions. 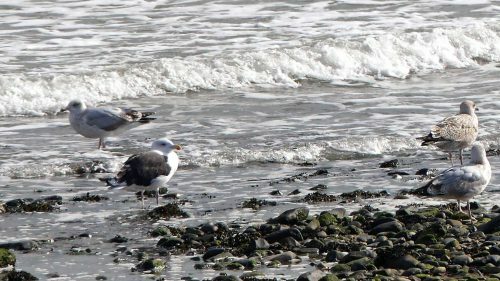 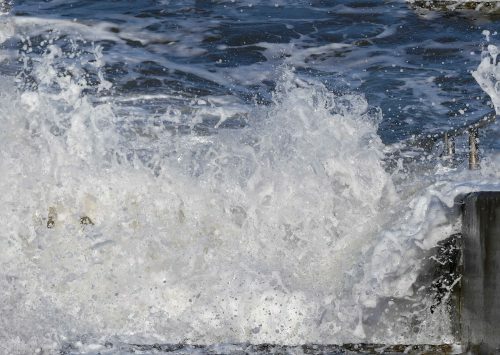 13:53 – The bigger gulls are unphased by the rush of the incoming tide and rather than fly away simply allowed themselves to be launched onto the water and rode the waves. 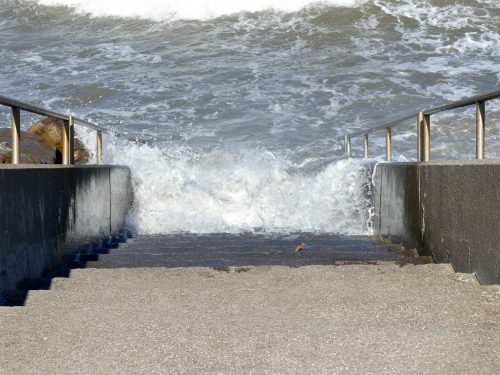 13:54- Wind-driven waves smash onto a flight of concrete steps and shows how high the water would reach if the rip-rap defences were not there; those steps below the middle are worn smooth and their edges rounded by the regular scouring of the waves.